The Handyguys are just a couple of avid DIYers sharing their experiences working around the house. Our podcast feature answers to your questions, head-to-head tool tests and other DIY and home improvement topics. If you have a question regarding your home, let us know using the â€œcontactâ€ tab on our site or call us at (615) 676-0877. If possible, we will respond to your question via email and may use your question on-the-air in a future broadcast. 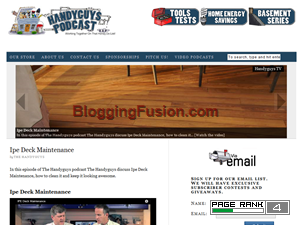 This what your The Handyguys Podcast Blog Ad will look like to visitors! Of course you will want to use keywords and ad targeting to get the most out of your ad campaign! So purchase an ad space today before there all gone! The post How to Get Your Lawn Mower Ready for Spring appeared first on The Handyguys. Looking to upgrade to a smart thermostat in your home? With a variety of options to consider, it can be challenging to decide which model is right for you and your space. Watch as home maintenance experts The Handyguys discuss some common features of smart thermostats and what to look out for when purchasing this new technology. Thank you to Allstate for sponsoring this post. The post Smart Thermostats: What You Need to Know appeared first on The Handyguys. Are you in the market for a new water heater? If you’re looking to replace your conventional storage water heater with something a little more energy efficient, you might want to learn more about tankless, or demand-type, water heaters. According to Energy.gov, if you and your family use less than 41 gallons of hot water per day, switching to a tankless water heater may save 24 to 34 percent more energy than a conventional storage water heater. If you’re looking to learn more about these demand-type water heaters, watch as home maintenance experts The Handyguys explain the pros and cons of tankless water heaters. The post Buying a Tankless Water Heater? What You Need to Know appeared first on The Handyguys. Have you ever forgotten to turn off a light in your home and been consumed by that thought as you drive to work? Or maybe, you’re napping on the couch and the light switch just feels too far away to get up and turn off. Well, thanks to smart light bulbs, you can turn these lights off with either your smartphone or voice. Watch as home maintenance experts The Handyguys explain how smart bulbs work and how you can install them in your home. The post Smart Light Bulbs appeared first on The Handyguys. In this video, The Handyguys review the TiVO Roamio . This device helps to eliminate excess cords and cables in your TV. The TiVO Roamio is compatible with devices that are open the box, plug, and play. The main pro of the TiVO Roamio vs. any other plug in antenna that provides HD content, is that the TiVO allows you to DVR content. The TiVO Roamio is a one time purchase. It will DVR your favorite shows, allow for streaming, and has an antenna signal guide. In past episodes, The Handyguys have tested out other streaming services for TV including the Roku , Apple TV, Google’s device, and the Amazon Fire . All of these streaming devices have nice interfaces, but The Handyguys’ favorite is the Roku due to its selection of apps. However, the Roku does not include over the air TV and sometimes you may have 2 devices that need to be plugged in. This is where the TiVO Roamio is helpful. The TiVO Roamio can handle over the air TV and programming. Unlike the Roku, you are unable to stream news on the Roamio. The Roamio is more expensive than the Roku, but as previously mentioned, does allow for DVR. The Roamio comes with a guide to all of its channels as well as what’s coming up. You can elect to record a how once or continuously. It even has a feature called OnePass where you can record new episodes and gather older seasons that may be housed on a streaming service that you are logged into on the device. You still need to have these streaming subscriptions as they do not come with the TiVO Roamio itself. The post TIVO ROAMIO REVIEW | HANDYGUYS TV appeared first on The Handyguys. In this final video on the Lutron Caseta lighting system, Handyguys Brian and Paul check Lutron Caseta and Amazon Alexa compatibility. In a previous video, The Handyguys check the Lutron Caseta’s compatibility with the Google Home. Lutron Caseta worked very well with the Google Home Mini and was compatible with not only commands but also with pre-set scenes that The Handyguys had programmed through the app. In order to use the Alexa , you must first add Lutron Caseta as a skill to the Alexa via your phone or tablet built-in app. You can do this by opening the app, choosing add a skill, discover devices, and choose Lutron Caseta . Your Lutron Caseta and Amazon Alexa system will be discoverable for each other via wifi and your smart bridge. After you discover the Lutron Caseta system, you can tell Alexa to turn on/off lights or pre-set scenes. If you’ve missed any episodes on the Lutron Caseta system, make sure to check out The Handyguy YouTube page and blog for more details. The post Lutron Caseta and Amazon Alexa Integration | HANDYGUYS TV appeared first on The Handyguys. If you are the owner of The Handyguys Podcast, or someone who enjoys this blog why not upgrade it to a Featured Listing or Permanent Listing?